Independent photographer, artist, and blogger, Mohini Patel Glanz, of Mango Power Girl, sliced and photographed these vibrant slices of peppers for her easy-to-make blog post recipe: Pepper Pita Pizza. Mother Nature’s palette is quite colorful. 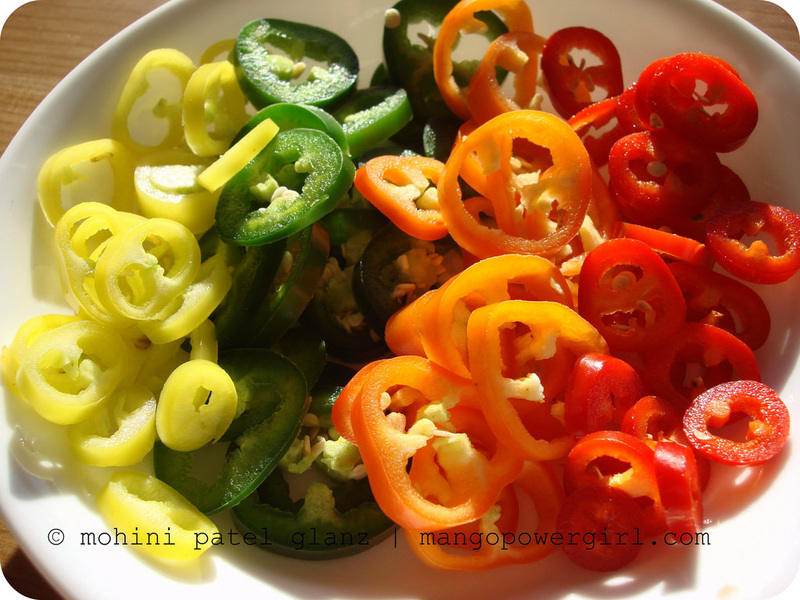 And when sliced, the peppers show off an interesting clover-leaf-like pattern. Today was the perfect day to pay tribute to New York City and I do so with one of its most famous foods, New York pizza! You can find great local pizza places at almost every other block in New York City. I learnt to eat pizzas in New York like I learnt to drink coffee in Seattle. As a lifelong vegetarian who loves to cook every day, I like to know what goes on my plate and where it comes from. My working single mother cooked meals from scratch every day; it instilled an appreciation and importance of good home-cooking for life. I always wished she had time to document her recipes, that is what inspired me to develop recipes & got me blogging a decade ago. It has also taught me to care more deeply about nature and the environment we live in. Check out her “Food” page for more of her colorful recipes.